Travelers passing through American Airline’s Terminal 4 at Los Angeles International Airport can now try out “smart restrooms” that will let them know which stalls are vacant or occupied through a light on the door. The technology was created and installed by Tooshlights and works similarly to parking garage lights, according to the company. Each stall unit consists of a smart latch and indicator light. 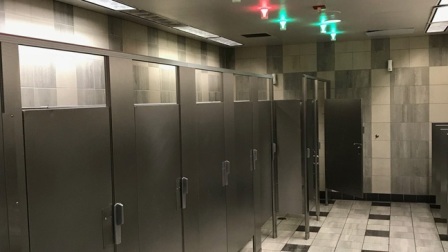 When a stall is available, the light is green, but when the stall is occupied, the light turns red. There are also blue indicator lights for ambulatory stalls. Under the pilot program, LAX and Tooshlights are also working with Infax so airport officials can track the occupancy usage of restroom stalls. In addition to the 20-plus “smart” stalls, LAX said the restrooms have touchscreens near the entrance/exit for guests to provide feedback and/or identify any issues that require a maintenance or custodial response.